The Garden Sun Outdoor Propane Heater is a great way to extend your outdoor entertaining into the fall or early spring with family and friends. Why waste your outdoor living areas. This attractive and durable heater brings outdoor living to an all new level. Too chilly to go out on your patio tonight, no problem, it's as simple as pushing a button on this tower of comfort, in minutes it transforms your patio, deck or pool area into a comfortable, warm, summer like area that can be used any time of the year. Finally, a quality outdoor heater that anyone can afford. Garden Sun now delivers all the same features, durability and great looks of units costing over three times the price. Dependable solid state easy-light push button ignition system never requires batteries or outside power of any kind, to light simply set your comfort level with the dial-a-setting knob and push the button. Your family's safety is your number-one concern, in the unlikely event the heater tips over the built-in safety valve will immediately shut the unit off. 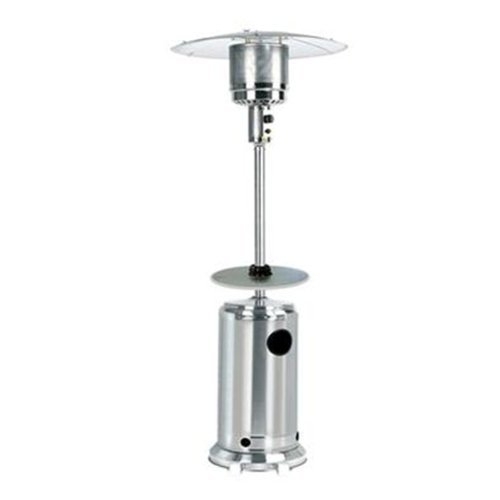 This vestal heater neatly conceals a standard bar-b-q style propane tank up to 30-lbs inside the stainless steel base. Powerful heat element produces over 44,000 BTU's of radiant heat that reaches out up to a full 15 feet around the unit (175 sq/ft). Stainless Steel construction holds up to any weather conditions, salt air and harsh sun, while retaining it's beautiful finish indefinitely. NOTE: Customers in the Cont US. are qualified for our FREE SHIPPING PROMOTION!!! Shipments to Canada, AK, HI, PR, and other US territories are subject to a shipping charge of $39.95. Please inquire about shipping to other locations.